Go from poolside to campsite with the Coleman Converta Cot. By day, it-Inchs a comfortable lounge chair, with a 4-position adjustable back and 2-position adjustable footrest. By night, it folds down flat for comfortable sleeping. The Converta Cot measures 25-Inch wide by 76-Inch long by 11.5-Inch high, fitting one person up to 6-Feet 2-Inch tall and supporting up to 225 pounds. It-Inchs durably constructed with a strong powder-coated steel frame, and weather-resistant polyester fabric that won-Incht stretch or lose its shape, so it stands up to repeated use. 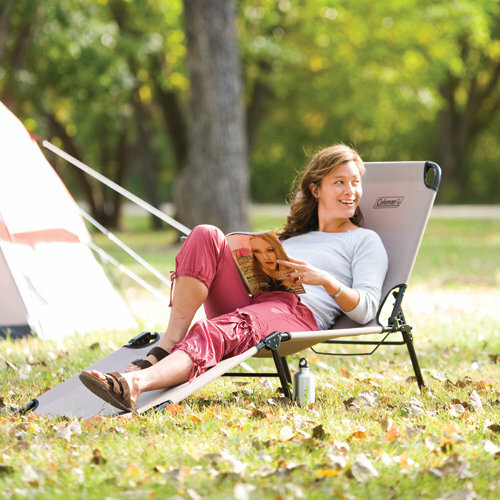 Seamlessly move from poolside to campsite with the Coleman Converta Cot. By day, the Converta Cot acts as a comfortable lounge chair, with a four-position adjustable back and two-position adjustable footrest. The Converta Cot features a 4-position adjustable back and 2-position adjustable footrest. It’s perfect for lounging in the afternoon sun with a book in hand. By night, however, the Converta Cot folds down flat, giving you a soft, supportive surface for sleeping. The cot fits conveniently inside your tent for a sleeping bag snooze or sits in the backyard for a mid-day nap. The Converta Cot is well built, with a strong powder-coated steel frame and a weather- and mildew-resistant fabric that won’t stretch or lose its shape over time. And at 76 by 11.5 by 25 inches (W x H x D), the cot comfortably sleeps individuals up to 6 feet 2 inches tall. The Converta Cot supports up to 225 pounds and weighs 11.6 pounds by itself. Comfortably fits people up to 6 ft. 6 in.